Linus, Shulz’ philosophical character in Peanuts, plays Beethoven on a toy piano with the black keys only painted on. He’s about six. Shulz concocted a prodigy of sorts in Linus, an unbelievable kid who would rather tinker with his piano than play marbles. And here’s comedy in his determination, because real six-year-olds normally don’t accomplish much; they do little more than doodle with crayons on walls. Art Ferrante and Lou Teicher were like Linus – they were never kids; they were prodigies. As little boys, barely six, they sat on New York City telephone books at Juilliard School of Music and ran through the rudiments of Mozart, stubby fingers dancing methodically over the keys of black uprights. They played together from the start, from that first awkward duet at Juilliard. The story of Ferrante and Teicher is classic one. They touched all the bases: classical music, composition, orchestration and conducting – tossing theory back and forth, and incidentally, becoming pretty good friends in the process. It reads like a time-lapse sequence in a 1936 musical, when calendar days rip away super-imposed over a montage of the seasons changing – leaves falling and turning to snow – and through it all the little boys practice the piano with undaunting determination. So, after years, two pianists emerged from Juilliard – talented, schooled, but decidedly wet behind the ears. Next step… bright lights, show biz, every boy’s dream to join the circus. The circus for F&T turned out to be back street bars, sleazy night spots and one night stands – the suitcase circuit, and rewards were slim. The public wasn’t quite ready for two classical piano players performing updated versions of renaissance music. But they pursued the dream, decked out in black ties with beer slopping over the table tops and bouncers throwing out the rowdies. For Ferrante and Teicher it took time, but it happened, finally. Eventually, their classical backgrounds gave way to a more accepted form of musical expression, called contemporary music. But it wasn’t until the recorded “The Apartment” that anyone turned to look over his shoulder. Then recognition came quickly. It only took years to become an overnight success. Ferrante and Teicher play gentle music for the late hours, for sipping Drambuie by the fire when the mood is mellow. And their classical roots are ever there, creeping into “Something” with a subtlety that is their trademark. Soft music hangs in the air – the unexplainable mystery of a gentle tune that somehow soothes jangled nerves. Poets have described it in verse and musicologists have tried to dissect it, but the mystery of music’s charm is still a fascinating puzzle. It can conjure up images, a dream quality, that bring mind-pictures to life. 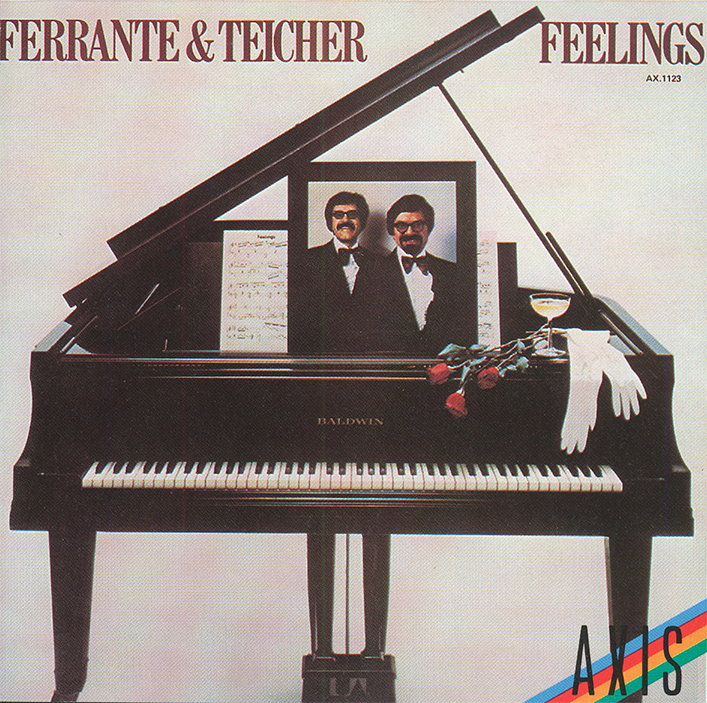 That is, simply, what Ferrante and Teicher do; they make music a visual experience – melancholy at times and nostalgic, if you like, but with the vividness of a neon light. And it does what it is intended to do – make no statements, just entertains.